Centrally located in Sandestin Golf Resort's Harbour Point neighborhood - just minutes from the beach! Tropical accents and a central location gives this getaway near the sea a zest for everything a resort vacation can offer! Your resort beach vacation awaits in this 1-bedroom, 1-bathroom condo in the centrally located Bayside neighborhood of Harbour Point on the Sandestin® Golf and Beach Resort. 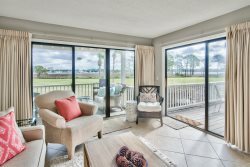 Enjoy expansive views of the Choctawhatchee Bay and Links Golf Course from your back deck plus you’re just minutes from The Village of Baytowne Wharf™ and of course those famous white-sand beaches. The new golf cart will add convenience and fun to your getaway by the bay! You can begin each day of your vacation in a unique way! Zip over to the Beachside of the property on the golf cart for a sunrise beach walk or stroll over to the Baytowne Marina for breakfast while the fishing boats head out or simply catch-up on emails from your private deck with beautiful bay views. The interiors of this property give way to comfortable conveniences like a full-size washer and dryer, newly updated stainless steel appliances and steps away to the community pool. Perfect for a couples’ getaway! Plenty of windows and natural light, keep the space feeling airy and open. The spacious, updated kitchen will offer a comfortable place for a quick breakfast or snack before heading out for an afternoon at the beach. When it's time to relax and recharge, two sofas and additional dining space provide an area for you and your guests. For those more active guests, reserve a round of golf or few games of tennis. For those waterbugs in your group, schedule a quiet paddle around the Gulf or even in the Choctawhatchee Bay exploring the diverse coastlines. Make lunch plans at The Village of Baytowne Wharf™ where dozens of dining options await! Spend your afternoon on the Beachside of the Sandestin® property and lounge, walk and explore some of the most beautiful white-sand beaches and emerald green waters! This is your vacation, exploring, lounging and sunning! Enjoy! This was our first time in Destin but it certainly won't be the last!! The area is great, the resort is top-notch, and the condo was perfect for us! We really appreciated the golf cart....not excited about having to drive a car when we get home! Very convenient location, comfortable condo....everything was wonderful, and we will be back very soon!! Thank you!! We stayed for a long weekend and enjoyed staying in this unit. The unit was very clean (which is important to us). Nice view and amenities in the complex. The unit was in great condition and we would stay here again! Charming condo. It is easy to locate. Very clean. I emailed the host a few days before with suggestions and they answered me promptly.